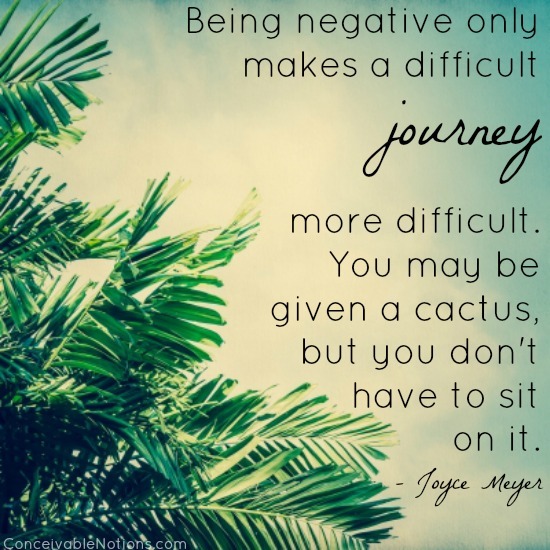 Conceivable Notions: Our TTC Journey: Stim Days 7 & 8: How Many Follicles? 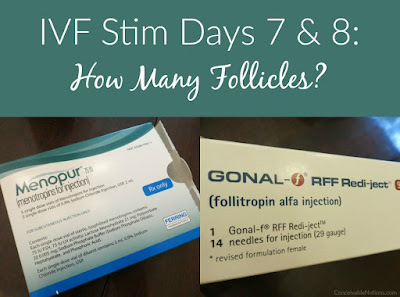 On stim day 7 of my IVF cycle, I went in for another follicle count ultrasound! At my last check, on stim day 5, I had 4 measurable follicles plus other smaller ones. I was told that the micro dose lupron flare protocol that I am on tends to move a bit slower than the antagonist protocol, so at that point they were happy with my progress. By stim day 7, it was time for another check! First I did my blood work, and then headed up for the ultrasound. I was a little nervous. Once I was in the exam room, one of my favorite doctors came in. It was really nice to have her do my scan! The first thing she checked was my lining, which was 8.6 mm. So my lining is already thick enough and is ready to go. My uterus had the 3 stripe pattern that they look for. So all looked good there. Then it was time to check the follicles. The right ovary was first. As soon as she moved the wand over, you could see a bunch of follicles! Immediate relief from my anxiety! She measured 7 total on that side, ranging from 10-15 mm, with most of them being in the 12-14 range. We were so happy to see them growing evenly! There were also two follicles that looked smaller that were not measured. The doctor said they might still grow and continue to catch up. Left ovary was next. It was pretty apparent that there wasn't nearly as much going on over there! She measured two follicles, both around 8 mm. There were also two follicles that were smaller and not measured. One of the things I noticed when she was doing my ultrasound, was that she had to put the wand in a kind of strange position to see the ovary on the screen. Now I've had a lot of these ultrasounds, and this has never happened before. But apparently, the left ovary has decided to shift into a funny spot. Which happens to be next to an absolutely huge blood vessel. If it stays in its current position, they are going to have to be extremely cautious attempting to retrieve the eggs from that side. If the eggs on that side don't grow too much, they may not even attempt to retrieve them. But if they appear to have a possibility of containing a mature egg, they will do all they can to retrieve them as long as it's safe to do so. Based on my follicle sizes and the way they expect things to progress, they currently are expecting me to trigger on Monday with retrieval on Wednesday! 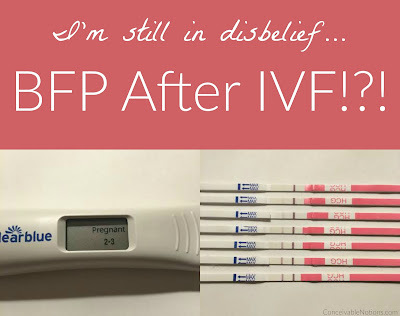 Obviously that could change, depending how things look at my next ultrasound.We left the appointment so happy! It really seems like this protocol is working better for my body. We ran into my IVF nurse in the hall, who wanted to hear how things went. I showed her my follicle print out, and she was so happy for us! Once my labwork came back, I was really interested to hear my E2. In my last update (on stim day 6), my E2 was 1142. By the next day, it was 1653. So originally I was supposed to skip a day of blood work, but because it was still rising quickly they wanted me to come in for another blood draw the next day. Arms are definitely getting a little sore. But they decided to keep my dosage the same for that night, with the possibility of decreasing the Gonal F the next day. So this morning (stim day 8), I headed off for my blood draw. I got the call this afternoon that my E2 had risen to 2327, which is still rising quickly. 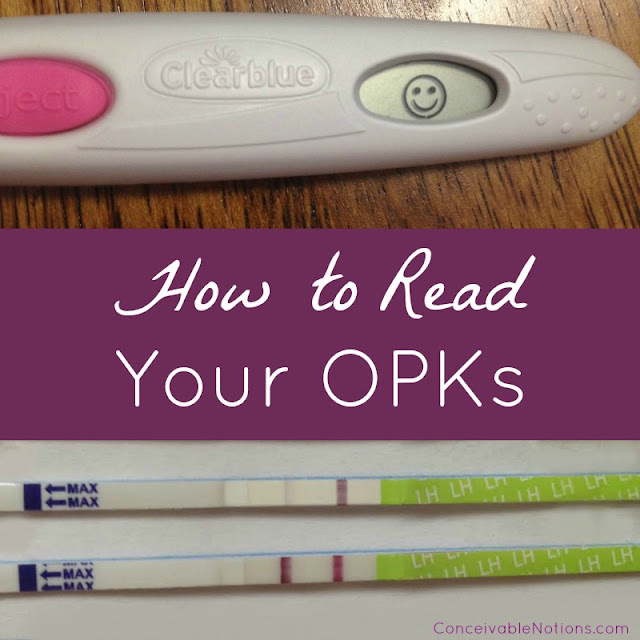 The nurse wanted me to review the OHSS symptoms and take steps to prevent it (increase salt, keep drinking fluids, etc). The E2 will continue to rise, so we want to be careful it doesn't rise too fast. So they lowered my Gonal F more than expected, down to 300iu. They kept my Menopur the same (one vial), and kept my microdose lupron the same. Tomorrow morning I head back for another blood draw (ugh! lol), and another ultrasound. I'm hoping to have a better idea of when we are expected to trigger, after my appointment tomorrow! Is this a recent thread? 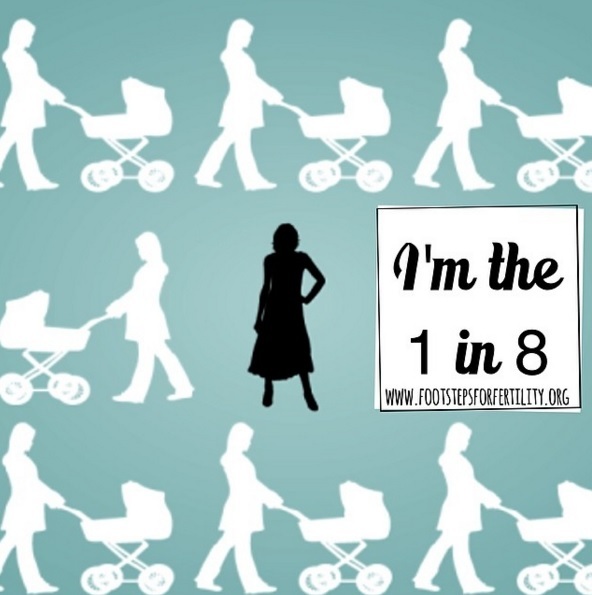 I'm currently at Day 7... seems like we have a lot in common with our cycles!